Jeff Nicholson has been around the comic book block. An old pro at the tender age of 36 he’s self-published his own comics as well as being published by some of the most influential companies in the business. Seems like the dude’s been around forever, but oddly enough I had never bought any of his books until recently. Some creators might be hurt that statement, but Jeff seems genuinely happy by the various new fans who have been drawn to his work with the release of his newest creation, COLONIA. Jeff “officially” entered the business in 1981 when he self- published ULTRA KLUTZ, a comic that began as a parody of Japanese superstar Ultraman but soon evolved into a convoluted and complex fantasy soap opera. Back in the early ’80s, too, there was a giant self-publishing boom in the comics industry when it seemed any illustrator with a dollar and a dream put out their own books. Most of these efforts fell into obscurity, a scant few ballooned into cultural icons (e.g. TEENAGE MUTANT NINJA TURTLES) and some titles, like ULTRA KLUTZ, developed a respectable fan base and earned much adoration and praise within the industry. But it’s a tough business. Most comic book self-publishers never make a living at it and have to support their artistry through other means, e.g. Jeff does contract work to supplement his income. One reason for this is because comics, by their nature today, are a marginal form of entertainment. Which is something I don’t think any comic book fan or creator can completely figure out why though most of them certainly have their personal theories. Since Jeff brought ULTRA KLUTZ to an end in ’93, he’s continued to reinvent himself over the years. His projects since then have included the surreal, disturbing graphic novel THROUGH THE HABITRAILS, the short-lived family drama/comedy series FATHER & SON and now his current work, the all-ages fantasy COLONIA. Though Jeff’s work has generally always been favorably received and reviewed in the comic book world, I had never taken a chance on him before. One of the main reasons being his books were never that easy to come by. 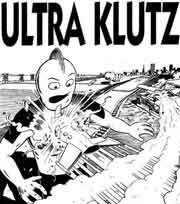 ULTRA KLUTZ sounded pretty much up my alley, but I’m not sure if I ever even saw it in a comic store until Jeff published a monster trade paperback reprinting the first half of the series. And while that looked interesting to me, there were always too many new comics for me to try than to experiment with a reprint edition of a cancelled one. But after moving to NYC, I thusly had easier access to more obscure comics, which I could pay for after landing a high-paying corporate job (sort of). I have to admit I was not completely enamored with the first issue I read (I think #3). The story centers on a young man named Jack and his two uncles who have entered a parallel Earth in which pirates and mermaids and fish-men fight for control of the high seas. And there’s a talking duck that lays golden eggs. While I enjoyed the fantasy world of COLONIA, I didn’t particularly like the intrusion of characters from “our” world into it. But to Jeff’s credit, he totally makes this scenario work and has created an engrossing tale in which I am continuously anxious to see what happens next. So far, COLONIA has run for five issues and has just completed it’s first story within the overall series. Future issues of the book will have Jack and his uncles get off of the high seas and venture further into the surreal landscape of Colonia, as the alternate-America in this parallel universe is called. I totally recommend the book, particularly if you have or know of any young kids into comics, but it is written for all ages and can be enjoyed by anyone looking for a good yarn.